When it comes to analyzing your landing pages performance we both know that your data won’t be able to be understood all on it’s own. 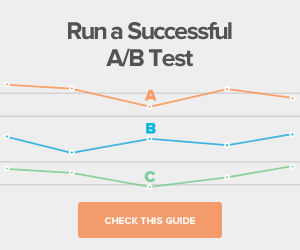 You can always get higher conversion rates, but to complete that process effectively and accomplish your sales goals, you’ll need some other apps connected to your landing pages to help you do that more efficiently. Not to mention, all of your new leads are also eventually going to need to be redirected to your CRM, to an email marketing list, spreadsheet or somewhere where you can continue accessing those potential clients and contacting them. And here at Lander we know that doing all of this work takes lot’s of time, effort and even may seem a bit overwhelming at first. That’s why today we’re proud to announce to you the latest Lander Integration: Zapier. In case you've never heard about Zapier or what this app does, here’s how this latest tool is going to really help you. Zapier is an app that allows you to connect your landing pages to other third party platforms such as Zoho, Sugar, Get Response, EMMA, Basecamp, Trello,Google Docs, Gotowebinar and much more! Zapier enables you to automate tasks between all of these different tools and other web services. Using Zapier you’ll finally experience just how easy it really is to sync all of your data from your landing pages to all the web services you use. Ok, so how does all of this work? "When I get a new thing in A, do this other thing in B”. Basically what they are saying here is that the first part is the trigger and the second one is the action that needs to follow or in other words “when this happens, do this”. You’ll need to select a specific trigger and then another action to automatically be performed in another app. For instance, when a "New Subscriber" completes your Form, a "New Row" would then be created in your spreadsheet. Once you set up these two aspects then Zapier handles all of the rest. Zapier also regularly checks your trigger for new data. For example when the “zap” (as the guys over at Zapier affectionately call any integration that you make) is triggered, Zapier automatically performs the necessary action for you. So without any effort from your part, data just flows easily from one integration to the other! Here at Lander we understand that time is money. So using Zapier there’s no more wasting your valuable time on any repetitive tasks you've had to do before. When set-up correctly, Zapier is right there, automatically taking care of those tasks for you so you can focus on more pressing and important business needs. What kind of integrations can I do? 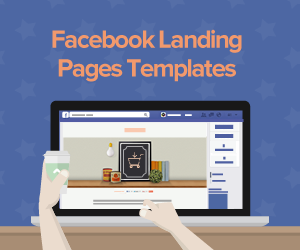 Ok, so let’s say you’re using your best Landing Pages to collect leads and now it’s time access those conversions to follow up on all those Leads. As we mentioned above, it’s so important that you feed those leads to a CRM, an email marketing tool, a spreadsheet or something where you can continue to have access to those leads and start contacting them. Create email subscribers using a tool like Emma, Get Response or Campaign Monitor. Add leads to a CRM like Zoho, Sugar, Infusion Soft. Register leads for a webinar in GoToWebinar. Create a Google Spreadsheets or Docs with all of your Leads. So thanks to this new integration, you’ll be able to get more out of your Leads and conversions than ever before. With Lander and Zapier you can focus on your Marketing Campaign and optimize your conversion efforts with maximum efficiency. 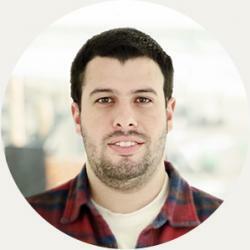 How do I integrate Lander, Zapier and my Third Party Platform? 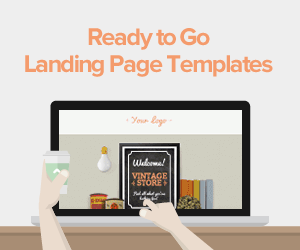 As you have already read above, you can easily integrate your Landing Page with a series of third party platforms. Let’s take a look below and see a specific example to show you exactly how to complete this integration. 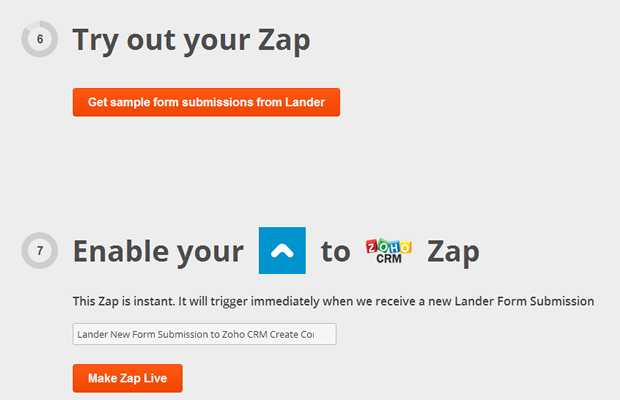 Let’s use as an example the ZAP between Lander and Zoho’s CRM integration. 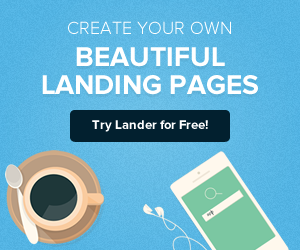 Read on to see just how easy it is to send your leads from Lander to Zoho automatically. An account on Lander, Zapier and in this case Zoho as well. You’ll need to create a Landing Page with a form: This is super important otherwise this integration would be impossible to do. Once you have completed the checklist above, it’s time to start the integration and see how it works. First of all you’ll need to access your Zapier account and select Lander in the section “When this happens” and then choose the Trigger “New Form Submission”. Once you've done that, you need to look for Zoho in the section where it says “Do this” and then choose as the action “Create a Lead.” Remember to click on "Continue" and Zapier will show you the URL to use in Lander. Now that you've set up the ZAP, go to your landing page Dashboard on Lander and look for the section entitled Integrations and choose Zapier. You’ll then be promptly asked for a URL, all you have to do here is just copy and paste the URL that Zapier gave you in our last step. Next it’s time to configure your Zoho account. Just write your Zoho email account and then you’ll be asked to complete a field with an Auto Token ( just click on the link provided there and you’ll be able to see it). Now you just need to paste it and then you’ll have your Zoho account fully sync’d with Zapier. Zoho uses an Auto Token, but depending on what other third party service is being used, the connection method may be a bit different. Once these two integrations have been connected to Zapier you’ll need to indicate to Zapier which field of your form will be redirected to your “Lead” in Zoho. With that final step it’s now all done and everything's all sync’d up, just click save and make your Zap live! Thanks to this integration you’ll be able to connect your Landing page with different apps with different functions. It’s time to automate tasks between this different online services. Let us do the heavy work! From now on your life would be easier thanks to Lander and Zapier. Save time and efforts, and focus on your business needs!